While I was sipping my coffee after school drop-off one day last year, this Facebook video by One Funny Mother about her daughter’s IEP meeting popped up in my feed. I don’t remember who shared it, but I watched the whole thing from beginning to end with tears streaming down my face. We talk about special needs parenting a lot here on Meraki Lane, and the rawness of Dena Blizzard’s words stayed with me for a long time. I’ve been meaning to write about Individualized Education Plans for some time now, but since IEP laws vary from country to country (and even from state to state (and province to province for us Canadian folks)), I wasn’t really sure where to start. I just didn’t know what kind of information to share, but then I realized I was getting caught up in the minutiae of it all and decided it would be much more helpful to provide IEP tips for parents. While there is a lot of information available about how IEPs are mandated within each individual school system, parents need to know how to navigate it all. They need to know how to prepare for an IEP meeting, what they should expect, what questions to ask, how to keep their emotions in check, and how to stay motivated in the face of so much noise and nonsense. Keep reading for our best IEP tips for parents to help you advocate for your child and ensure they reach their highest potential. Also known as an ‘Individualized Education Plan’, an IEP allows teachers and school administrators to work with parents to ensure children with disabilities are able to succeed in a regular school setting. An IEP identifies a child’s individuals strengths, challenges, needs, etc., sets out specific educational goals, identifies accommodations that are to be made for the child (and who is responsible for ensuring those accommodations are made), and tracks the child’s progress over time. This is not an exhaustive list, and there are many other reasons a child may benefit from an IEP. If your child is struggling in school for a reason other than those listed above, speak with his/her teachers and other school administrators about special accommodations that can be made, and how you can start the process of developing an Individualized Education Plan. We frequently hear parents gripe about IEPs and IEP meetings, and while the process is often difficult and overwhelming, it’s important to remember that an Individualized Education Plan is designed to help and not hinder your child. The whole purpose of developing an IEP is to formally recognize what your child’s strengths and challenges are, and develop and enforce special accommodations to ensure he or she is successful in a school environment. Of course, that’s not to say the process will always be easy. Anytime a child is identified as being ‘different’, there’s a risk he or she will be ostracized, have challenges with his or her peers, and struggle with low self-esteem. IEPs have also been known to lower the expectations placed on a child by both parents and teachers, which is why it’s so important for parents to get involved and continue advocating for their children. I hope the IEP tips for parents provided in this post help you do just that! Whether you’re preparing for your first IEP meeting in your career as a special needs parent, or you’re an old timer who needs a refresher, these IEP tips for parents will help ensure the meeting goes as smoothly as possible. 1) Keep an ongoing open dialogue with your child’s teachers. You don’t want to go into an IEP meeting feeling completely clueless about how your child is fairing at school, so find ways to connect with your child’s teachers throughout the school year so you remain up-to-date on both the good and the bad. Exchange pleasantries at school drop-off and pick-up, send check-in emails at regular intervals, and don’t be afraid to organize periodic meetings to discuss your child’s progress and any other pressing concerns. The more involved and aware you are, the more prepared you’ll be for your child’s IEP meetings. 2) Educate yourself on IEP laws. Since the IEP laws vary by country, state, province, etc., make sure to educate yourself on your child’s rights, and take notes on the things that specifically apply to him or her for easy reference during your IEP meeting. Teachers and school administrators aren’t always up-to-date on IEP laws, so it’s important that you do your homework and come to the meeting prepared! 3) Set aside time to reflect. Pencil in some time a week or so in advance of your meeting so you can review your child’s IEP (and subsequent IEPs if you have any) and assess his or her progress. Has anything changed since your last meeting? Is your child reaching his or her goals? Are special accommodations being followed? Take the time to make notes so you are prepared to talk about each item, and think of examples to support your observations. 4) Write out SMART goals for your child. After you’ve reviewed and reflected on how your child is performing based on his or her current IEP, spend some time brainstorming goals you would like him or her to work towards in the coming months to discuss during the meeting. Make sure they’re SMART (Specific, Measurable, Attainable, Relevant, and Timely) and that they push your child beyond his or her comfort level while still being realistic. 5) Be prepared. IEP meetings can be extremely emotional for parents, making it more important than ever to arrive prepared. Many parents create an IEP binder in which they store a copy of their child’s IEP along with any other medical reports, psychological assessments, etc. that they may need to reference throughout the meeting. I also suggest including printouts of the IEP laws that govern your child’s school board, as well as a list of talking points and questions you want to cover during the meeting. Make sure your IEP binder is as organized as possible so you can locate important information quickly. You can use a standard 3-ring binder with sheet protectors, and then organize the material using binder tabs. Highlight important information and use Post-It Flags for easy reference, and include blank paper and a pen so you can take notes throughout the meeting. 6) Bring a support person. The school will include a list of attendees in your IEP meeting invitation, which will help prepare you for the number of people you will be facing and what role each person plays in your child’s education. Take the time to consider who you would like to attend the meeting with you for support. Your spouse? A therapist? A lawyer? Consider this carefully, and ensure to take someone for support, even if you don’t feel it’s necessary. IEP meetings can be very emotional, and having someone on your side can make a world of difference. 7) Rest and relax. IEPs can be emotionally draining for parents, so it’s important to take steps ahead of time to ensure you are starting the process off in a good frame of mind. Make sure you get a good night of sleep the night prior and clear your schedule before and after the IEP meeting so you aren’t feeling frazzled. It may also be helpful to go for a workout before your meeting to clear your head, and make sure you have someone you can lean on afterwards if things don’t go as planned. The more relaxed and supported you feel, the better. 8) Start with a positive attitude. As daunting as IEP meetings can be, I truly believe a positive attitude can make a world of difference. If you show up to your child’s school angry, defensive, and ready to pick a fight, you will project those feelings onto everyone else in the meeting. Remember that everyone in the meeting has the same goal as you do – to help your child be as successful as he or she can be – and make a conscious decision to start with an open mind. You can still be assertive and call teachers and administrators to task as the meeting unfolds, but remain cognizant that your initial attitude will set the tone for the entire meeting and can have a ripple effect on how your child is treated at school. If you’re looking for more IEP tips for parents to help make sure your child’s school experience is as positive as possible, and that you’re working collaboratively with his or her teachers and school administrators, these ideas are worth a read. 1) Accept your child’s diagnosis. It’s very common – and normal – for parents to become extremely defensive and protective of a child with special needs. This can be born out of guilt, denial, and a whole host of other unresolved emotions, but the sooner you can accept your child’s diagnosis and educate yourself on what it means for his or her future, the sooner you can become an active and willing participant in his or her IEP. 2) Work WITH instead of AGAINST your child’s IEP team. As much as we want to blame someone for our child’s struggles, I can promise you one thing: lashing out at your child’s teachers, learning support team, therapists, and/or school administrators isn’t going to do your child any favors. If you want your child to be successful, it’s up to you to find ways to work collaboratively with his or her support team. 3) Keep lines of communication open and honest. It can be very difficult to discuss your child’s struggles with others, but if you want to create a supportive environment for your child to help him or her reach important goals, you need to keep the lines of communication open. At times, this will require you to relay information that feels uncomfortable, and there will be situations in which a teacher or therapist has to initiate difficult consultations with you as well. The more receptive you are, the easier things will be, and the more successful your child’s entire team will be as a result. 4) Be realistic. When it comes to creating and assessing your child’s IEP goals, it’s important to be objective. While some may set their expectations too high given their child’s strengths and abilities, others may actually be afraid to push their child to their fullest. Check in with teachers and therapists for help in evaluating what is and is not realistic to ensure you are being fair to your child. You want to push him or her as much as possible, but obviously within limits. 5) Keep the emotion out of it. Of all of the IEP tips for parents out there, this is probably one of the most important while also being the hardest! It can be extremely difficult not to burst into tears or erupt into anger when other people are seemingly picking your child apart during an IEP meeting, but don’t allow your emotions to cloud your judgement. Stay as level-headed as possible so you can make informed and rational decisions. 6) Don’t sign anything in the meeting. You are within your rights to ask for additional time to review and digest the information presented in your child’s IEP, and should never feel pressured to sign something until you’re 100% comfortable. Even if you agree with everything discussed in the IEP meeting, I still encourage you to take a copy of the IEP home for one more review before signing on the dotted line. It is amazing how our feelings can change and how much we miss when we’re emotional and put on the spot, and that added time can make a huge difference. 7) Ask if you can record the meeting. Having a recording of your child’s IEP meeting can be extremely helpful as there are many things you may miss during your discussion, and you may need to go back and review the information at a later date. Just be sure to check the IEP laws that govern your child’s school to confirm this is legal, and to inform the school prior to recording. 8) Never stop advocating for your child! No matter how defeated you feel at the end of your child’s IEP meeting, remember that it is up to you – and only you – to keep advocating for your child. Take the rest of the day to process the information and feel sad if you need to, but make a conscious decision to wake up with renewed determination the next day. No matter how difficult things feel in this moment, have faith that they will get better. They say that life is 10% what happens to us, and 90% how we respond to it, and if you’re looking for IEP tips for parents, this is perhaps one of the best pieces of advice to remember. 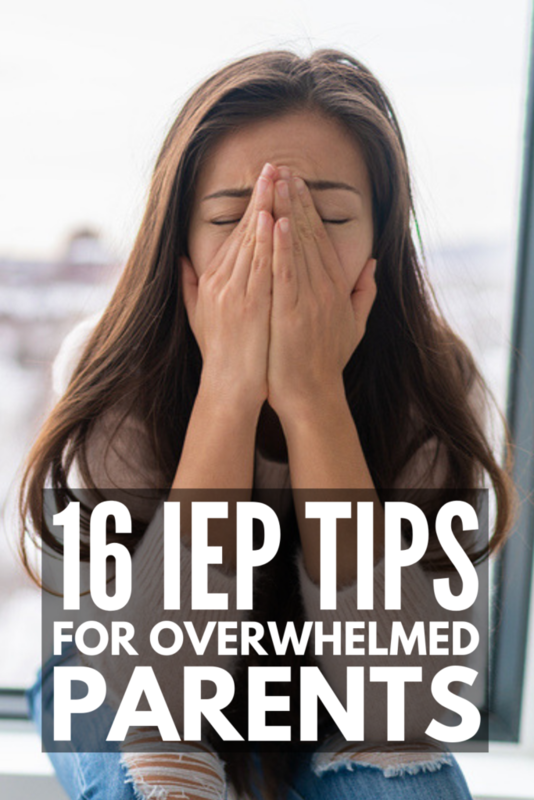 I hope this collection of IEP tips for parents proves useful to you. Remember to be open and honest, to give yourself ample time to plan and prepare, to be realistic and objective, and to have faith in yourself and your child. If you found this collection of IEP tips for parents helpful, please share this post on Pinterest! And if you’re looking for more tips and tricks to help your child with special needs, please follow our Special Needs board where we share all kinds of helpful ideas we find each day!